How to control pain and what are the suitable painkillers? Can a tooth abscess be treated at home? Should you go to the emergency room for a dental abscess? What happens if a dental abscess is left untreated? Periapical abscess: it is the most common type of dental abscess. It often develops as a result of dental caries, cracks, or trauma. Bacteria from caries spread to the tooth pulp, causing infection and inflammation. As a result, the abscess forms at the root tip. Gingival abscess: this type occurs in the space between the gum and the tooth at the “neck” area of the tooth. It doesn’t affect the tooth or the PDL (The periodontal ligament). It usually occurs when food or foreign-body is trapped around the tooth. Note: the PDL is a group of connective tissue fibers that attach the tooth to the bone. 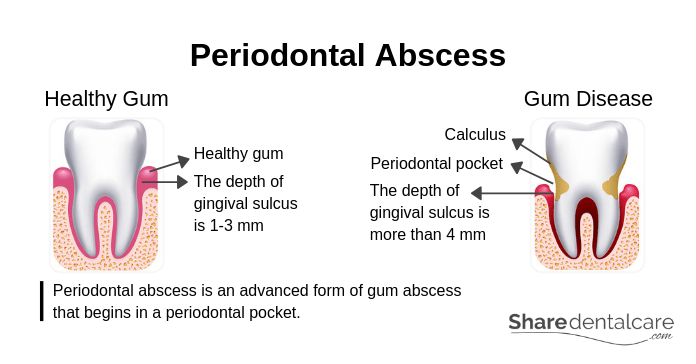 Periodontal abscess: it is an advanced form of gum abscess that begins in a periodontal pocket. It usually develops as a result of gum disease. Also, it can occur when food or foreign body is trapped in the periodontal pocket. Pericoronal abscess: it is usually associated with pericoronitis around impacted or partially erupted lower wisdom tooth. Note: pericoronitis is inflammation of operculum, a gum tissue covering an impacted or partially erupted tooth. 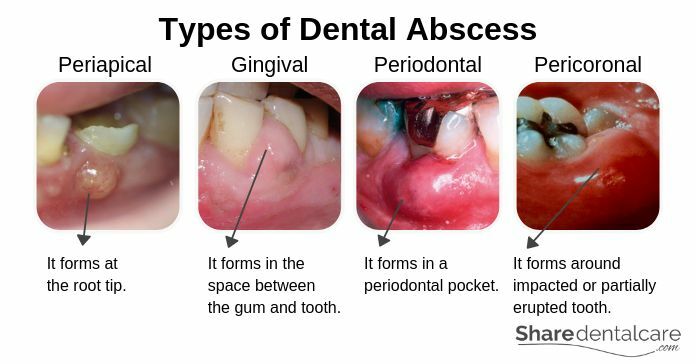 Types of Dental Abscess: Periapical abscess, Gingival abscess, Periodontal abscess, and Pericoronal abscess. Persistent, growing, throbbing pain in the affected tooth or the surrounding gum. The pain may spread to your ear, jaw, or neck. Hot foods and drinks may induce extreme pain. The pain gets worse when you lie down. Putting pressure, chewing, or biting on the affected tooth may induce extreme pain. Swelling of the lymph nodes under your jaw or in your neck. Fever and a general unwell feeling. Discoloration of the affected tooth. The affected tooth becomes loose. Difficulty in opening the mouth and swallowing. Dental abscess is the result of a bacterial infection. However, how this occurs depends on the type of abscess. Each tooth is made of several layers. The outer layer is the enamel which covers the dentin (the second layer). The enamel and dentin are the tooth’s protective layers. Underneath the dentin, there is the pulp which contains nerves and blood vessels. The periapical abscess occurs when bacteria invade the pulp through dental caries, crack, or fracture in the enamel and dentin. Then, the infection spreads all the way down to the root, causing swelling and inflammation at the root tip. 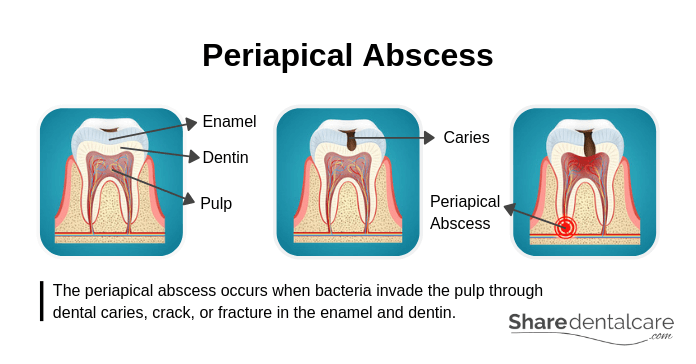 The periapical abscess occurs when bacteria invade the pulp through dental caries, crack, or fracture in the enamel and dentin. Gingival abscess usually occurs when food or foreign-body is trapped between teeth and gums. It involves the gum tissue only near the gingival margin (the coronal part of gingiva) and doesn’t affect the tooth or the periodontal ligament (PDL). Periodontal abscess is an advanced form of gum abscess that begins in a periodontal pocket. Healthy gums fit and fill each space between the teeth. Also, the depth of the space between the tooth and the surrounding gum (gingival sulcus) is 1-3 millimeters. With gum disease, the gum becomes inflamed and the depth of the gingival sulcus increases (more than 4 millimeters), leading to the formation of periodontal pockets. The periodontal pocket can become an infected space, causing a periodontal abscess. Periodontal abscess is an advanced form of gum abscess that begins in a periodontal pocket. Pericoronitis is inflammation of the gum covering and surrounding a partially erupted or impacted tooth. It is usually associated with impacted or partially erupted lower third molars (wisdom teeth). Pericoronitis usually occur as a result of the accumulation of bacteria and food debris, or trauma (biting). It causes pain, bad taste in the mouth, and gum swelling. In some cases, pericoronal abscess occurs, an accumulation of pus within the gum tissue surrounding a partially erupted or impacted tooth. Poor oral hygiene: inadequate oral hygiene increases the risk of dental caries, gum disease, and tooth abscess. Consumption of foods and drinks high in sugar: consumption of sugary foods and drinks increases the risk of dental caries that can extend to the pulp, causing a tooth abscess. Medical conditions: such as diabetes mellitus and dry mouth. Uncontrolled blood sugar increases the risk of gum disease and periodontal pockets that may cause the formation of an abscess. Press or tap on your teeth with an instrument: if the tooth is infected, it will be very sensitive to pressure or tapping (percussion). Take an x-ray: sometimes, a periodontal abscess can be difficult to differentiate from a periapical abscess. So, your dentist will take an x-ray to identify the exact location of the abscess. Recommend a CT scan: your dentist may recommend a CT scan if he/she suspects that the infection has spread to other areas. 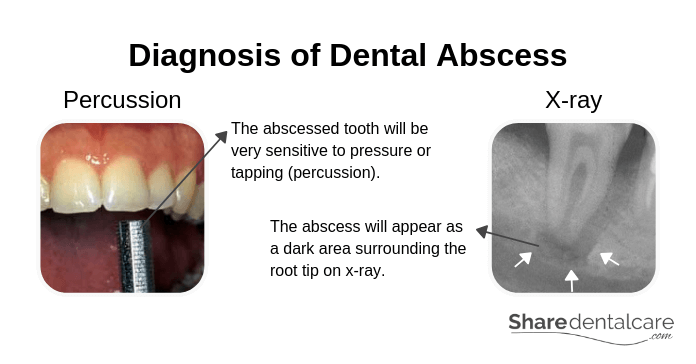 Diagnosis of Dental Abscess: the abscessed tooth will be very sensitive to pressure or tapping (percussion), and the abscess will appear as a dark area surrounding the root tip on x-ray. Abscess drainage: the dentist will make a small cut (incision) in the gum to drain the pus. Then, he/she will clean the area with saline (salt water). This is a temporary solution and further treatment is needed. Root canal treatment: in the case of a periapical abscess, the dentist will open access in the affected tooth to remove the inflamed or dead pulp tissues. Then, he/she will clean the root canals with instruments (dental files) to eliminate the infection. After that, the dentist will fill the root canals and the tooth to prevent the recurrence of infection. Tooth extraction: if the tooth is severely damaged and can’t be saved. The dentist will extract the tooth to get rid of the infection. Removal of trapped foreign-body: if the abscess is caused by trapped food or foreign-body, the dentist will remove the foreign-body and clean the area with saline (salt water). Scaling and root planing: in the case of a periodontal abscess, the dentist will clean the periodontal pockets. Also, he/she will perform scaling and root planing to remove plaque and bacteria, and prevent further infection from occurring. Operculectomy: if the dental abscess is associated with pericoronitis, the dentist may recommend Operculectomy, a minor surgical procedure involves the removal of gum tissue (operculum) that overlaps the impacted or partially erupted tooth. Wisdom tooth extraction: also, the dentist may recommend the extraction of lower third molar (wisdom tooth) to prevent further occurrence of pericoronitis and pericoronal abscess. If the dental abscess is severe or has spread to other areas such as ear, jaw, and neck, the dentist will prescribe antibiotics to prevent the infection from spreading and help clear the infection. Also, he/she will prescribe antibiotics for patients with a weakened immune system. Only use antibiotics when prescribed by your dentist. Antibiotics don’t substitute dental treatment. Dental abscess is usually painful. you may need over-the-counter (OTC) pain relievers to control the pain while you are waiting to see a dentist. Pain relievers include ibuprofen, paracetamol, and aspirin. However, these pain relievers are not suitable for some patients. So, you should ask your doctor or pharmacist before use, especially if you have medical conditions or allergic reaction to any other pain relievers. Stomach bleeding or a history of stomach problems. Allergic reaction from taking pain relievers. Allergic reaction to acetaminophen or other pain relievers. Stomach problems such as ulcers, heartburn, or stomach pain. Allergic reaction to aspirin or other pain relievers. Pain relievers are only for pain control and don’t replace a visit to a dentist. If a dental abscess is left untreated, it may lead to serious complications. If an allergic reaction occurs, stop using the pain relievers and seek medical help immediately. Dental abscess won’t go away on their own and can’t be treated at home. However, these home remedies can relieve the pain until you are able to see your dentist. Avoid hot or cold foods and drinks: hot and cold temperatures may cause extreme pain. Avoid sugary or acidic foods and drinks: acidic foods and drinks reduce the pH of the oral cavity. Changes in oral pH can cause more pain. Don’t chew on the affected area: don’t floss around the affected area or chew on the affected area because these actions can increase the pain. Also, use a soft-bristled toothbrush to clean your mouth and help reduce the inflammation. Sleep with your head elevated: when you lie down, the blood rushes to your head. This may increase the pressure on the affected area in the mouth, intensify the pain, and keep you awake. So, sleep with your head slightly elevated. Use OTC pain relievers: for example, ibuprofen, paracetamol, and aspirin. High fever (more than 38°C / 100.4°F). Swelling of the neck or around the eyes. Tender lymph nodes in the neck. Severe pain that can’t be controlled by pain relievers. These signs and symptoms indicate that the infection has spread to other parts of the body. It is a pathological cavity that contains a fluid or gaseous content. It develops around the root tip because of the death of pulp tissues secondary to caries or trauma. In x-rays, it appears as a dark area around the root tip. Dental cyst progresses slowly and can go unnoticed for months or even years (asymptomatic). However, it causes pain and swelling when becomes infected. The treatment include root canal treatment or surgical procedure. The surgical procedure is performed if the dental cyst is large or persists after root canal treatment. The condition may occur as a result of the spread of infection to the maxillary sinuses. It is not a serious condition. However, it can be painful. The symptoms include headache, foul-smelling nasal discharge, and fever. It is a bacterial skin infection. The dental infection can spread to the face, causing swelling (cellulitis). The symptoms of cellulitis include pain and feeling of warmth in the affected area, facial swelling, fever, and redness of the affected area. It is a type of severe cellulitis and a life-threatening condition. Ludwig’s angina occurs when the infection spread to the floor of the mouth, underneath the tongue. It is also known as submandibular space infection or submandibular cellulitis. The signs and symptoms include intense pain in the floor of the mouth and the neck, lower facial swelling around the mandible and upper neck, and fever. Also, Ludwig’s angina can cause severe swelling that obstruct the airway, causing difficulty breathing and swallowing. Go to the emergency room (ER) if you have the symptoms of Ludwig’s angina. It may require a surgical procedure to open the airway if you have difficulty breathing. 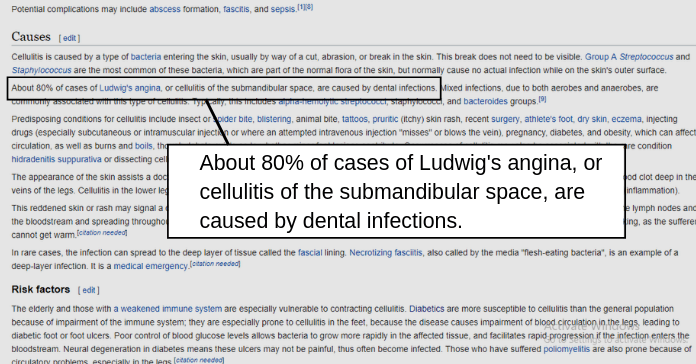 About 80% of cases of Ludwig’s angina, or cellulitis of the submandibular space, are caused by dental infections. It is an infection of the bone that may occur due to the spread of dental abscess bacteria through the bloodstream into the bone. The patient may experience severe pain in the affected bone, nausea, and fever. Usually, osteomyelitis affects the bone near the site of dental abscess. However, the infection can spread through the bloodstream and affect any bone in the body. Osteomyelitis requires prolonged antibiotic treatment (oral or intravenous antibiotics). The spread of infection can lead to the formation of blood clot in the large vein underneath the brain. It is a very rare, life-threatening condition. The treatment includes antibiotics and sometimes surgical drainage. It is a life-threatening condition that occurs when the body’s response to an infection injures its own tissues and organs. The symptoms of sepsis include increased heart rate (tachycardia), increased breathing rate (hyperventilation), and fever. Go to the emergency department whenever sepsis is suspected. Early treatment includes antibiotics and large amounts of intravenous fluids. Maintaining good oral hygiene: brush your teeth at least twice a day, especially before going to bed. Use fluoride toothpaste to help strengthen tooth enamel and prevent dental caries. Also, use dental floss to clean the interdental spaces. 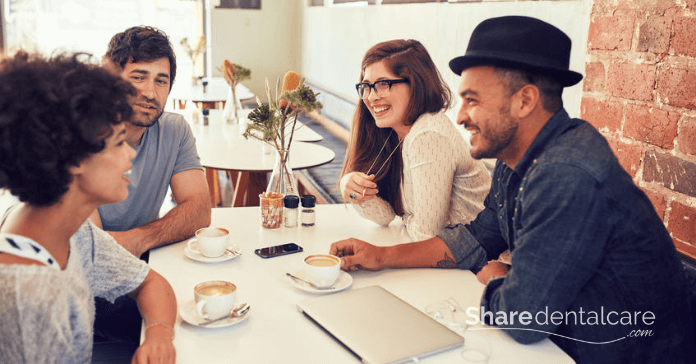 Eating a well-balanced diet: Limit sugary foods and drinks. Drinking a lot of water: to prevent dry mouth. Also, chew sugar-free gum to stimulate the production of saliva. Visit your dentist regularly: visit your dentist at least once every 6 months for a regular check-up and professional cleaning. Do you have a toothache? Do you suspect you have a dental abscess? Visit your dentist as soon as possible. Your dentist will relieve the pain and eliminate the infection. Dental abscess won’t go away on its own and can’t be treated at home. It is not safe to drain dental abscess at home. If you can’t reach your dentist, use OTC pain relievers until you are able to see him/her. Also, avoid hot or cold foods and drinks, and don’t chew on the affected area. Go to the emergency room if you have severe facial swelling, high fever, difficulty swallowing, or difficulty breathing.